Is your home low on space? Want to find a more convenient place for that cumbersome and noisy washer and dryer? If you answered yes to both of these questions, then I have some tips for you. Your garage is the perfect place to hook up your washer and dryer. It is generally clean, easy to access and will give you more space with less noise in the house. Here are a few ways to decide on and to complete this change for your home. Let’s start at the beginning, first of all you need to consider your weather situation. If you live where it is really cold, then you will need to get the garage heated (You will need an air conditioner), the same goes for the reverse, if it is really hot where you live, you will need to get your garage insulated. Speaking of heat and temperature, when you are washing your loads in the garage, be sure not to dry large items, like comforters, blankets, etc. inside the garage. It will cause the humidity level to raise which can make for an uncomfortable atmosphere. If you have to do this for any reason, you should invest in a dehumidifier to offset the humidity. So we all tend to wonder, what am I getting out of doing this? This is a question we ask ourselves whenever we act, and this is no different. It is important to know what you can gain from something in order to ensure you feel motivated and want whatever it is. So here are some reasons why you can benefit from placing your laundry room into the garage. 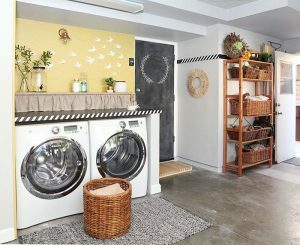 If you place your laundry room in the garage, it will allow you to bring a purpose to an otherwise unuseful part of your home. A well planned laundry room here will complement your home adding a nice touch. Placing the laundry room here will be convenient and help to serve as a sound proof room for the loud sounds and vibrations these machines make. You can add to the equipment you will place out there such as a second refrigerator, an outside pantry, or a freezer. There are more reasons I am sure you can think of, but I am sure you see the point. 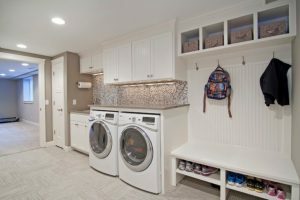 There are plenty of benefits to adding a laundry room to your garage. Now comes the important part, figuring out where in the garage your laundry room should go. It can be placed virtually anywhere in your garage, but there are a few things you should consider. Remember that there will need to be plumbing access for your washer and dryer so that hot and cold water can be used and for drainage purposes. There will also need to be a vent for the dryer so that the moist air doesn’t stick around. The next step is to consider the fact that you will need electrical outlets for these machines. If you are not skilled in the plumbing or electrical field, then it is best to let someone who is work on this aspect. There is no room for error on these areas, and it helps you to have more time to decide on carpentry and to finish up. If your garage is not heated, or if it is complicated to keep at a average temperature, then a false floor may be a great option for you. It will be a cooler place to work and help with the temperature. We have covered a lot of ground for creating your new laundry room inside your garage. However, there are a few more things you may want to consider. One of which is to paint the garage, starting with the walls and ceiling. If you would like to paint the floor, epoxy paint produces maximum durability and results. Another great addition would be adding lighting to brighten the area and shelving for storage. Finally, it is a great time to downsize any clutter that you have been holding on to. There are plenty of charities around that would greatly appreciate it! If you are looking to have some work done on your garage door or need some tips for your garage, contact the garage door experts. Clarks Garage Door & Gate Repair is well known for their service and passion on the job and can efficiently and quickly handle any job you may have for them. They can even come the same day that you call! Clarks Garage Door & Gate Repair for more information at (213) 769-1370. News: Cat Gets Roll-Up in Garage Door – So Cats Really Do Have 9 Lives?